Technology pioneer, APSU, the most highly accredited IBM business partner in Europe, joined more than 250 guests at the Sunday Times Tech Track 100 Awards Dinner held at Vinopolis in central London on Wednesday, 27 November 2013. Managing director Paul Bromelow and group marketing director Gerry Burke were present to accept their Tech Track 100 Award, marking APSU as one of Britain’s fastest growing tech companies. Ranked the top company in the south-west of England and number 20 overall, APSU entered the list for the first time with a 129% annual sales growth over the last three years. 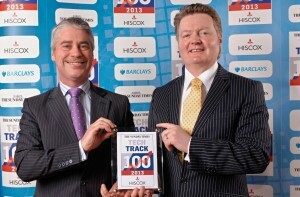 The Hiscox Tech Track 100, published in The Sunday Times, is organized by Fast Track, the UK’s leading networking events and research company, and the annual awards are now in their 13th year. Title sponsor Hiscox, main sponsor Barclays and award sponsor the London Stock Exchange joined an impressive panel of speakers, including Dr Mike Lynch OBE, the founder of Automony, Piers Linney, the new ‘dragon’ on BBC2’s Dragons’ Den, and Lord Paul Drayson of Drayson Racing Technologies. Hiscox is a specialist global insurer with over 100 years of underwriting expertise. The company works with organisations and individuals to provide cover that is tailored to suit often complex and unusual insurance needs. Fast Track is the UK’s leading networking events and research company which focuses exclusively on top-performing private companies and entrepreneurs, and publishes league tables ranking them in the The Sunday Times. Barclays moves, lends, invests and protects money for customers and clients worldwide. With over 300 years of history and expertise in banking, the company operates in over 50 countries and employs over 140,000 people. The London Stock Exchange is the world’s most international exchange. Over 2,500 companies from over 90 countries are quoted across its markets, with a combined value of £3.7 trillion.